Photo: J. M. Alderdice House, ca. 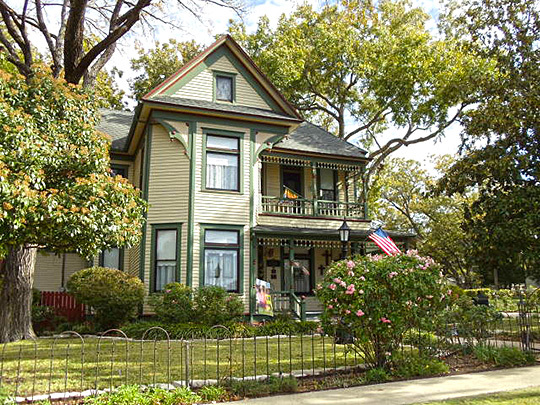 1895, 1500 West Main Street, Waxahachie, TX. Listed on the National Register of Historic Places in 1986. Photographed by User:Renelibrary (own work), 2011, [cc-by-3.0 (creativecommons.org/licenses/by/3.0)], via Wikimedia Commons, accessed February, 2013. The Ellis County Courthouse is located at 101 West Main Street, Waxahachie, TX 75165; phone: 972-825-5000. The county was established in 1849 from part of Navarro County and named for Richard Ellis [1781-1846] who served as president of the Texas Constitutional Convention.